IUI - How it's done? Depending on your particular fertility problem you may or may not be advised to use fertility drugs alongside the IUI treatment. If fertility drugs are used it is called a "stimulated cycle" because the drugs stimulate ovulation. If drugs are not used it is called an "unstimulated cycle" or "natural cycle". Stimulating ovulation is not recommended alongside IUI if it's only your partner that has the fertility problem, or if the reason for infertility is unexplained. This is because there is a much greater risk of a multiple pregnancy in these cases. While many couples with fertility problems think that twins or more would be a great way to start a family, the reality is that multiple pregnancies increase your risk of miscarriage and other pregnancy complications. In unstimulated cycles, IUI is timed to take place at the time of natural ovulation. You may be asked to detect ovulation using an ovulation predictor kit, or your doctor may track your cycle using blood and urine tests. IUI is usually done between about day 12 and day 15 of a natural menstrual cycle, but the exact day will depend on your particular cycle and when ovulation is detected. If your fertility specialist has offered you IUI during a stimulated cycle, you'll probably be given fertility drugs in the form of an injection and nasal spray. You'll start taking the drug near the beginning of your menstrual cycle to stimulate your ovaries to develop several mature eggs for fertilisation. (You normally release only one egg a month.) Your doctor will use ultrasound to detect ovulation and make sure that insemination is carried out at the optimum time. 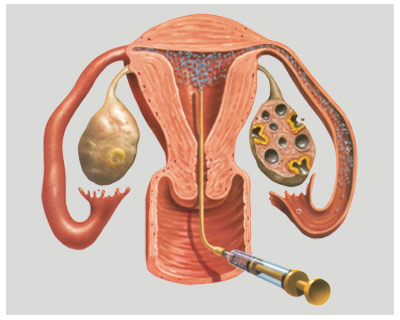 You may ovulate naturally, or be given an injection of the hormone hCG (human chorionic gonadotrophin) to bring this on. Once you ovulate, your partner produces a sperm sample, which is "washed" to extract the best quality, most mobile sperm. Using a catheter (tube) through your cervix, doctors then put this sperm directly into your uterus near a fallopian tube (the passage the egg travels along from an ovary to your uterus). This is IUI. If you have unexplained infertility, the sperm may be inserted within a larger volume of fluid than usual so it can wash up into the fallopian tubes more easily. This technique takes a few minutes more than standard IUI and is known as "fallopian sperm perfusion". It has been shown to increase the chances of success in cases of unexplained fertility. You rest for a short time afterwards and then carry on life as normal. You'll be able to take a pregnancy test in about two weeks. How successful is an IUI? Success rates depend on the causes of you and your partner's infertility and your age. The success rate for IUI with fertility drugs is about 15 percent per cycle.